In the south of Oman, the area around Salalah offers a unique combination of landscapes. The Hilton Salalah Resort itself is an oasis of Oman luxury – on the shores of the Indian Ocean, surrounded by coconut trees, papaya and banana plantations. Relax by the pool, laze on the white sandy beaches, work out in the gym or enjoy a quick game of tennis. Enjoy a holiday with your family. Guests may choose from any of the resort's 147 spacious rooms with magnificent views of the Indian Ocean or of the majestic Omani Mountains. Picture, if you will, a journey off-road to the desert and an area known as the Jebel Samhan, where the Frankincense trees grow in the northern foothills that run into Neijd. This is the beautiful Dhofar region, famous for its hushed valleys, tropical plantations and green, wooded mountains. 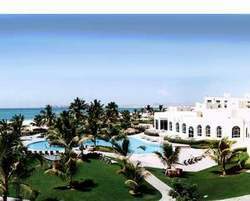 All Hilton Salalah Resort rooms have high-speed internet access. Step up to a Deluxe Room, Deluxe Plus Room or Suite for mountain and sea views. Wake up to this 42m² stylish room with separate seating area and high-speed internet access. Get to work at the large desk in the working area, take time off in the easy chair or sofa and gaze at the mountain view. Special touches include magazines, mineral water, chocolates and fruit. Indulge yourself in this 42m² stylish room with separate seating area and a balcony with a partial sea view. Catch up on work at the large desk in the working area, surf the web with high-speed internet, or relax on the sofa. Spoil yourself with magazines, mineral water, chocolates and fruit. Soak up the garden and sea view from the balcony of this 42m² room with separate seating area. Catch up on work at the large desk in the separate working area, check email with high-speed internet access, or just relax on the sofa. Make a luxurious suite your home from home and savour the mountain or sea view from the balcony. Enjoy a meal at the dining table, surf the web with high-speed internet or just relax on the sofa. Spread out in the Grand Suite, with living room and second bathroom. Sit out on the terrace and enjoy a tasty breakfast, lunch and dinner at the Hilton Salalah Resort's Al Maha restaurant. Choose from an à la carte menu of regional and international cuisine in this informal Salalah restaurant steeped in Oriental decor and with views over the pool and gardens. Steeped in Arabian-inspired decor and low lighting, Sheba's Restaurant at the Hilton Salalah Resort serves international and Arabic cuisine. Enjoy your evening looking out onto the garden from this Salalah restaurant. Taste lobster and yellow-fin tuna on the edge of the Indian Ocean at the Hilton Salalah Resort's Palm Grove Beachside Restaurant. Taste from an extensive menu of Asian, Arabian and international cuisine at this unique beachside Salalah restaurant. It is closed during the Monsoon season.